If you live in the Americas and you regularly listen to a shortwave radio, you have no doubt heard Radio Havana Cuba across the shortwave spectrum. When I travel in North or Central America, I can easily hear RHC, often without even extending the telescopic antenna on my portable. 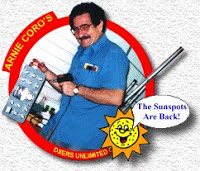 A long-running program on RHC's English hour is Arnie Coro's DXers Unlimited.